Thanks for liking Get Rich Slowly. Like TIME on Facebook for more trusted news analysis, award-winning multimedia & behind-the-scenes looks with TIME editors. 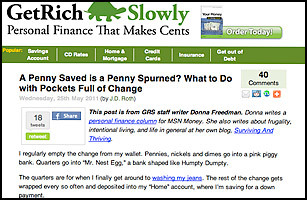 The Web is rife with financial sites that appear to be written by and for people with tiny dollar signs for eyeballs. J.D. Roth's Get Rich Slowly, on the other hand, lives up to both its name and its mascot (a turtle). It's about goals that can take decades to achieve  making a down payment on a home, saving for college, ensuring a comfortable retirement. Everything's guided by the Get Rich Slowly philosophy, which includes such eminently sensible tenets as "Money is more about mind than it is about math." And though Roth says he's just a regular guy, not a financial pro, his advice is full of real-world wisdom. In addition to running this award-winning blog, Roth is also a contributor to TIME�s newly launched personal-finance vertical, Moneyland.